Just stumbled on this nice deal, and thought a few of you might be interested! The deal is on the BBE Tremor (Dual Mode) Tremolo. This pedal lists for $169.00, and is usually available for $120, but is currently on sale for only $89.99 at Amazon.com. Additionally, this pedal also has FREE super saver shipping! The Tremor is a dual-mode tremolo that utilizes an optical circuit to create a wide range of warm pulsating sounds normally associated with the vibrato” effect of vintage tube amps. The Tremor offers the flexibility of two independent speed controls that are foot switchable, enabling you to select between a slow and fast tremolo at the stomp of a switch. 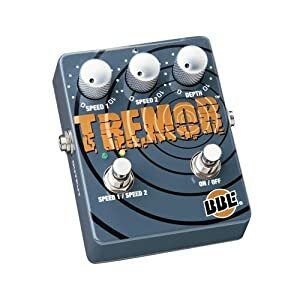 Again, the BBE Tremor Dual Mode Tremolo is available for only $89.99 at Amazon.com. At the time of this posting, there were only 4 units in stock, so if you want to take advantage of this price, you’ll want to jump on this deal! Evan Marien Bass LoopingEarthQuaker Devices Disaster Transport SR Give Away!